Restless Nightmares Vol. 3 is coming June 2, 2015! Pre-order today! The terrifying nightmares continue! Restless Nightmares Vol. 3: A Collection of Petrifying Short Stories releases June 2nd, 2015 on Amazon.com! The latest installment in the horror anthology series will feature ten unique and frightening short stories. This creative set of stories is set to feature ghosts, demons, mutant creatures, spiders, true-to-life horrors, and much more! It's a balanced blend of traditional and experimental horror — expect the unexpected. 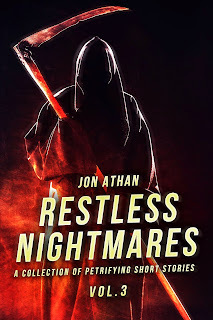 Starting today, you can pre-order Restless Nightmares Vol. 3 for $2.99 — that's likely less than your daily cup of premium coffee or daily commute. The book will exclusively launch on Amazon. When the book launches, you'll also be able to borrow it using Amazon's Kindle Unlimited and Kindle Owner's Lending Library programs. Make sure you either pre-order now to get it immediately on release or bookmark the page to borrow it later. Regardless of your method, thank you for the support! From the bottom of my heart, I am truly grateful for your readership. I sincerely hope you enjoy the new book. If you enjoy my short scary stories, don't forget: I publish new books frequently and you can stay up-to-date by checking the My Books page on this website. Writing Updates for May 2015! First and foremost, Restless Nightmares Vol. 2: A Collection of Terrifying Short Stories successfully launched one week ago. Thank you for supporting the latest release. I'm sincerely grateful for your readership — I honestly can't thank you enough. I hope you are enjoying the new stories and I hope you're anticipating more. If you've been hoping for more, you'll be glad to learn Restless Nightmares Vol. 3: A Collection of Petrifying Short Stories has been completed. Well, it's currently in the proofreading phase, but it is very close to completion. The book will feature ten uniquely terrifying short stories. Some of the stories are a bit more experimental than my past work, but there are a few familiar ghost and demonic stories in the bunch — I believe it is a balanced mixture of traditional and experimental. I don't want to release too many details, though — I really don't like spoiling my work. In this case, there are a lot of twisted plot points I'd rather keep secret until release. I can say, however, this book will be a tad bit longer than the previous installment. It has approximately 2,000 more words, despite featuring the same amount of stories. The cover will be revealed closer to release, as well. So, when is the launch date? As of now, I'm currently aiming for June 2, 2015. Of course, things can go drastically wrong causing changes in the schedule, but I'm feeling optimistic. Aside from Restless Nightmares Vol. 3, I'm already working on my next book codenamed ETV1 — a respectful tribute to one my favorite shows of all time. Once again, thanks for the support and I hope you're enjoying the books. Restless Nightmares Vol. 2 is out now! Hello! Restless Nightmares Vol. 2: A Collection of Terrifying Short Stories is available on Amazon now! You can purchase it for $2.99 or borrow it using the Kindle Unlimited and Kindle Lending Library programs. Regardless, thanks for reading. Like all of my work, I was very passionate about this project. I hope I can continue writing for as long as possible. Your support allows me to continue living the dream! From the bottom of my heart, thank you! For more information on this book, please visit the Amazon product page or read my previous blog post. Buy it today for $2.99! "Tales From Under The Bed" Series Book Sale! To celebrate the upcoming release of Restless Nightmares Vol. 2: A Collection of Terrifying Short Stories this coming Sunday, I've decide to have small sale for my previous horror anthology series. So, for the first week of May, readers in the US and UK can enjoy deep discounts on select books in the Tales From Under The Bed series. 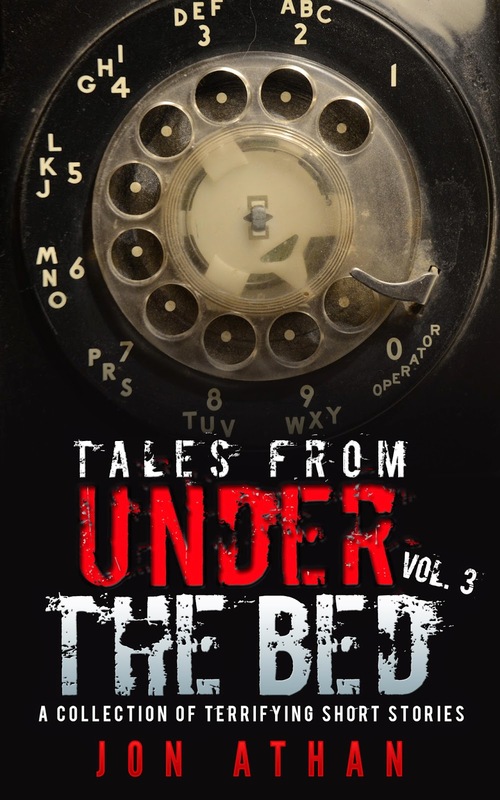 Starting May 1st and ending May 8th, you can purchase Tales From Under The Bed Vol. 4: A Collection of Petrifying Short Stories on Amazon.com for $0.99 — that's a massive 67% discount! This is also the first time this brand new installment has ever been on sale. If you enjoy stories of ghosts, possession, and talking decapitated heads, this is for you. 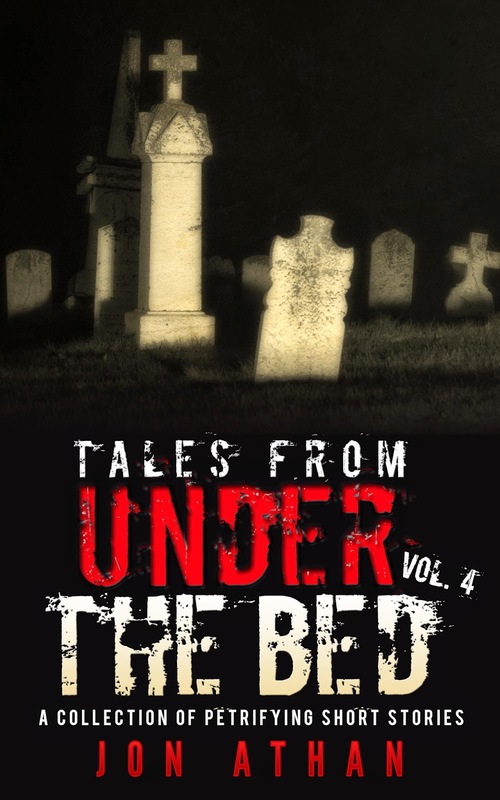 Along the same dates, Amazon.co.uk customers receive a similar discount on Tales From Under The Bed Vol. 3: A Collection of Terrifying Short Stories. The bestselling installment in the series, Tales From Under The Bed Vol. 3 will sell at a mere £0.99 throughout the sale week. This installment includes a grandma with a sinister secret, a haunting Ouija app on a mobile tablet, and psychopathic parents. Only £0.99 for a limited time! Remember, this sale is to celebrate the upcoming release of Restless Nightmares Vol. 2. Thank you for the outstanding support. As long as you continue reading, I'll continue writing. You keep my passion burning.